Se quedó la del empate en posición de anotar. #Dodgers 0-1 #Cubs . Mitad de la 2a. The #Cubs will accept the #Dodgers ' willful disregard for common sense. #NLCS #Dodgers #Cubs . Wow, that's exactly what the Nationals did! What were they thinking on that one? #NLCS #Cubs Out by a mile! Tag out by Rossy! #Cubs still lead. Joins Werth/#Nationals send from Thursday. NO! NO! NO! Ross says! #Cubs still lead 1-0 and going to B2! #defense makes me happy. Now #letsgetsomeruns #cubs @cubs ❤⚾???????? BOT 2ND: Ben Zo nails Gonzales at home! #Cubs lead 1-0! 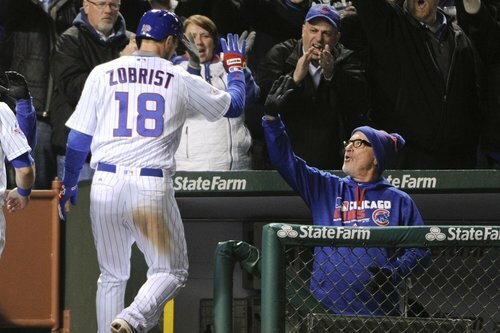 Zobrist with a strike to throw out Gonzalez! Credit to the #Cubs for a shallow alignment there. Kenta Maeda singles on a grounder to left, but Adrian Gonzalez is thrown out by Zobrist at the plate.